This is such a neat casserole dish! It would be so cute for taking to family dinners and other fun events. I love the color too! Be sure to enter to win one of your very own below. Good luck! Azure Cast Iron Flower Casserole dish is handcrafted from molten cast iron with a cast iron enamel finish. With a capacity of 77.8 oz, you can cook most anything in this in your oven up to 482°F. I especially love that this is something that can easily go from oven to table (while using oven mitts and hot pads of course). No more grabbing food from on top of the oven or having to dirty another serving dish just to make the meal look presentable. This casserole is also dishwasher and freezer safe. 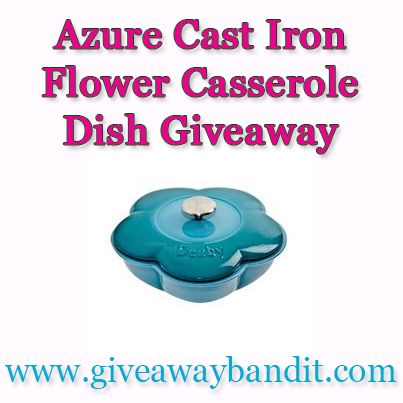 Denby USA is going to give one of A Lucky Ladybug’s lucky readers an Azure Cast Iron Flower Casserole of their own! Enter to win via the Rafflecopter entry form below. Giveaway ends August 29, 2013 at 11:59 pm EST. Open to US only, ages 18 and older. I love the Malmo Vase! I would like the Cherry Cast Iron Grill Pan. I would like the Imperial Blue Medium Oblong Dish! I like the Lucille Silver dinnerware. Set of 3 mini casseroles (blue). I like the imperial blue curved casserole. I like the Imperial Blue Kitchen Collection 16 piece dish set, and also the Cherry Curved Casserole Oven to Table baking dish. I like the Imperial Blue Cast Iron Oval Casserole. They are “currently updating their site.” This dish looks great though! I like the set of bright three mini casseroles. What I like about your blog is that it is layed out well and your son is so cute as a bandit! One item I like is Denby’s Jet Curved Casserole. The azure cast iron griddle pan!! I like the Cherry Medium Oval Dish. I love the Cast Iron Grill Pan in the cherry color. Thanks. Besides the flower casserole dish, I would love to have the Azure cast iron oblong baking dish from Denby. Waht a beautiful casserole dish!